Looking to get a 1911 eventually.. I don't want to spend more than 1k, I would only use it to mess around at the range. What's the best 1911 under 1k? If I just want a decent 1911, how much would I realistically have to spend? I'd go for any of the springfield models in the under 1K range. Even the base model mil-specs are great shooters out of the box. There are some Colt models available in that price range but the examples I've had needed much reworking to be reliable. There are quite a few other brands also in that price range but they always have questionable reliability. Years ago I would of said Springfield. The last two new Springfields I have shot have been over $1000 and relatively poor overall. Their customer service is almost rude. I've bought my last Springfield, 100%. Personally, I am waiting for the EAA Girsan .45 1911 to come out. Check out the FN FNX, it's 1911-ish, sorta and my favorite Pistol. Anymore with gun manufacturers, get one you like from someone with good customer service. Then if there is a problem it will be solved without hassle. I've not heard anything good about customer service from EAA maybe they've improved in recent years. The FN FNX is nice pistol but to say it's 1911 ish is like saying a semi auto is revolver ish. They just aren't the same thing. There are lots of good choices in that price range and a lot depends on the user. If you get the chance, try out as many as possible to see what features you want.... e.g. ambi safety, extended slide lock, beavertail, sights, etc. Those things can be changed over time, but the more you like it out of the box, the more you will shoot it. Also, different brands have different frames when it comes to heft and feel. Ya, parts may be interchangeable, but a Springfield, Colt, and S&W with similar grips & components will all have a slightly different heft and feel to them. There is nothing magical with any company, I’ve seen $1,000 lemons from Springfield and 100% reliable $450 Rocks. Do note that going from a GI model to one with a beavertail is a pain, and some companies may have some parts interchangeability issues (para comes to mind, don’t know if that is still the case). And remember... it’s your first one, don’t go overboard or over think it, you will want different features/upgrades after shooting it for a while. I have both 45ACP and 9mm SA's. Very true to John Browning's original Colt design. But as much as I like my SA's, I really enjoy shooting my FN-FNX45 Tactical 15+1. John Browning helped launch the FN Herstal factory a century ago, and I believe he'd be proud of what they've wrought. FN's entry for the US Military's sidearm competition several years ago, after a century of technical improvements. But yes, apples and oranges. Well jeez, lets put our thinking caps on here. EAA. They import arms from different countries and manufacturers. They have the logistics to deal with. You might not get overnight service. The FNX has been compared to a 1911 about a million times online. It also replaced a 1911 at my nightstand. If your use to training or working with a 1911 it is a easy transition. To say a FNX is more like a revolver than a 1911 is just ignorant. That not what I said. I suppose if you go back and re-read what I wrote you'll clearly see I said it's like saying a semi-auto is revolver ish. The FN FNX while some may compare it to a 1911 is not even close and they are just plain different platforms. The FN being DA/SA and staggered mag design and the 1911 being SA only and singe stack. As far as EAA goes their customer service was very poor at one point and had nothing to do with who they import from and as I stated maybe at this point they have improved. The FNX can be run single-action only with safety, or depress the safety further downward and it decocks the pistol onto DA/SA mode. Really nice setup IMHO, and unlike Beretta's bass-awkwards design you can ride the safety down on the draw like a 1911. There are a lot of subtle refinements on the FNX if you look closely. Fully ambi controls, really nice SR tritium sights that also co-witness an optic-ready slide cut, threaded barrel, adjustable backstrap, undercut trigger guard and 'beavertail' for high grip, durable nitrided barrel and slide, light-rail, slightly flared magwell, ohh and did I say 15+1 with a grip that's only 1.32" wide. But, it's NOT a 1911 if you're a purist. However, if you just like superb firearms....you might say it's a 1911 on steroids. There are a lot of subtle refinements on the FNX if you look closely. Fully ambi controls, really nice SR tritium sights that also co-witness an optic-ready slide cut, threaded barrel, adjustable backstrap, undercut trigger guard and 'beavertail' for high grip, durable nitrided barrel and slide, slightly flared magwell, ohh and did I say 15+1 with a grip that's only 1.32" wide. Agreed. I'm not knocking the FN in any way it's just not the same as a 1911 any more than a glock is the same as a hammer fired gun. I got rid of my 1911's but still have DA/SA .45's and like that style better. Different platforms are different platforms. I probably won't ever go back to a 1911 but I won't be getting rid of my CZ 97BD or Sig P227 any time soon. As much as I've liked 1911's they just don't fit me and I like a grip with more girth. I own a Rock Island Ultra FS in 9 mm...…. under 1000 bucks....by 350 bucks under $1000 and a very good and reliable hand gun. I heard so much rumblings on the internet about how "bad" Rock Island guns were that I bought a Para Expert .45 (for under 1000 bucks as well) and was and still am very happy with that gun. It is a great shooter and it eats ant .45 ACP ammo I have purchased or made for her. Match grade barrel puts hoes in holes. Nice gun!!!!! Then my buddy bought at .9mm RI Ultra Tactical (with a rail and double stacked) and I shot it. The very next day I bought the 9mm Ultra FS and I will tell you this. It is a very good gun. Not for the money, but the fact that is less expensive then a lot of guns that require a lot of work to equal this guns trigger and reliability is a big plus. If you aren't happy with a Ultra FS from RI you can easily get your money back and you probably will need to spend more then 1000 bucks to get happy. This is just the opinion of this poster and is not or does not represent an endorsement or even advise. I just call it like I see it, and I see this gun at the range with me often. I wouldn't buy a Springfield because they gave money to anti-gun politicians in Illinois in exchange for favors. But that's a subject for another thread. I had a Springfield Loaded 1911 that was total garbage, couldn't get through a box of ammo without having some kind of malfunction. I love my Ruger SR1911. It's under $1000, it looks great and it's been the most reliable semi-automatic handgun I've ever owned. 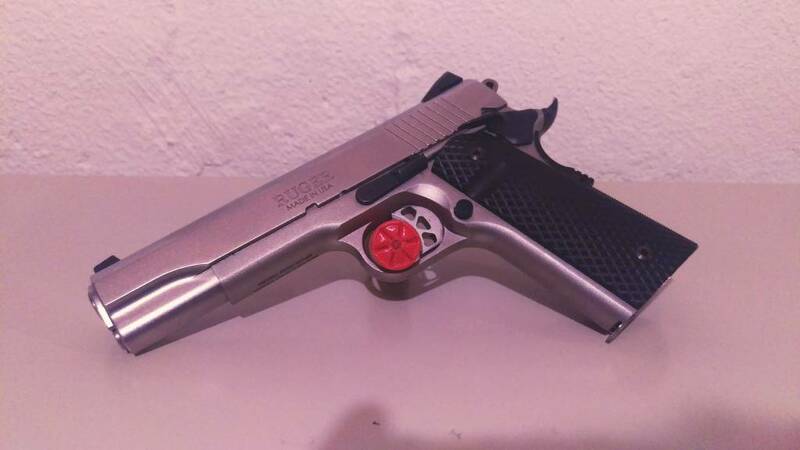 I have to admit the trigger on a friend's Ruger SR1911 is very impressive out of the box. Overall very nice finish and softened edges. I got my SA's before their blunder. None since. I also would recommend the Ruger SR1911. Mine has been trouble free.